As with so much of what crosses my reading path, I can’t recall how this book initially came to me. Originally published in 1998 by Polestar, it was reissued by Caitlin Press in 2010. And with that Braid begins the imagining. 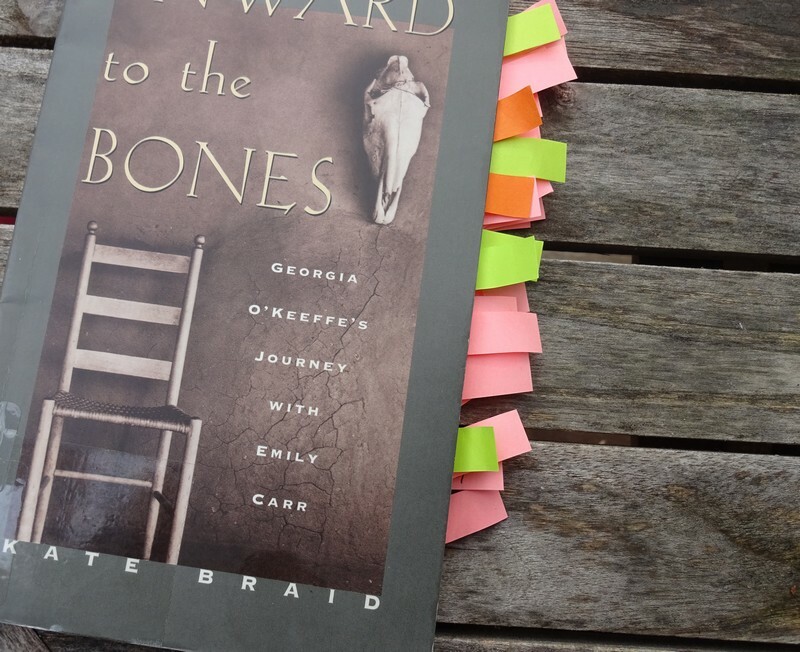 The result is a slim, gorgeous volume of poetic verse written in the voice of Georgia O’Keefe (so true is this voice that the book feels more whispered than written) and based on Braid’s research of both women. Many of the details are founded in actual events (footnotes are included at the back of the book and, in themselves, make good reading). The story she tells begins with a brief nod to the era in which O’Keefe grew up, the late 19th and early 20th century, a time when women were not taken especially seriously in the art world; O’Keefe tells us about her involvement with the photographer Alfred Stieglitz and, eventually, her thirst for something more, a deeper relationship, a sisterhood of artists. 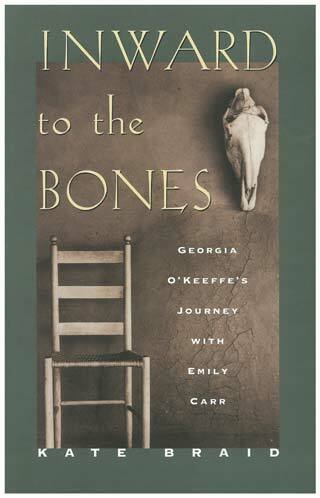 By the time she meets Emily Carr we’ve pretty much forgotten this telling isn’t entirely real, that the invitation from Carr to join O’Keefe in New Mexico to walk and paint the desert with her, never happened. And yet, there is Emily Carr in the desert with Georgia O’Keefe. There is Carr, feeling out of place and pining for green in the heat of New Mexico while Georgia O’Keefe looks on and complains about this weird companion. Then a trip to Bandelier National Park changes everything and suddenly Carr finds connection among the cacti, mesa, bones and bluer than blue sky. Ultimately their similarities win out… different lives, shared passion. O’Keefe also visits Carr’s world and tromps about Vancouver Island in her black clothes and fedora, finding nothing among the giant red cedars, dampness, moss, rotting logs and lichen that speaks to her in a language her desert soul understands. You might say the book is like a painting made by either O’Keefe or Carr, the power of emotions visible through what appears to be the most ordinary of things. In this case: respect for the sisterhood of artists. What if they’d caught each other’s attention? Such a good question. Braid makes us feel it’s a loss that they didn’t, while at the same time convinces us that surely they did. I remember reading an article in BC Book World about Kate Braid years ago, after Journeywoman: Swinging a Hammer in a Man’s World was published, and being fascinated by her carpenter/poet take on a workplace that was (and still is, for the most part) hostile to women. She apparently is a master of interesting juxtapositions, and I love this O’Keefe/Carr one so much. I’ve been thinking for years about writing a novel about my two grandmothers (who were extremely different and in actuality never met) living next door to each other and becoming friends. The idea behind this book is similar, but bolder and brassier – Kate Braid’s chutzpah at imagining two such iconic (and different) artists as friends takes my breath away. I can’t wait to read it! But, yes, juxtapositions! What fun. I hope you consider writing about your grandmothers. Even if only a personal essay to begin with. And I think you will love ‘Inward to the Bones’.